I guess I’m guilty of assuming that everyone who fishes on the Big Bend has a boat. I’m hardly an elitist, but consider myself lucky to have had access to, or ownership of, a boat for the last 50 years. However, I’ve never taken wading, seawall, pier or dock fishing out of the equation when it comes to having a good time on the water. Boats are nice, but they can also be a pain. I have two small boats and two kayaks, and it seems I spend lots of time keeping them seaworthy, tuned up, clean, and ready for action. I also have to tend their trailers—and those don’t even float! And then there’s the money factor. It seems that there’s always a way to spend a couple of hundred bucks on something for any of the boats. Expenses can range from minor DIY wiring repairs to bigger things like new props, lines, push pole replacements, and yearly tune-ups. It all adds up. 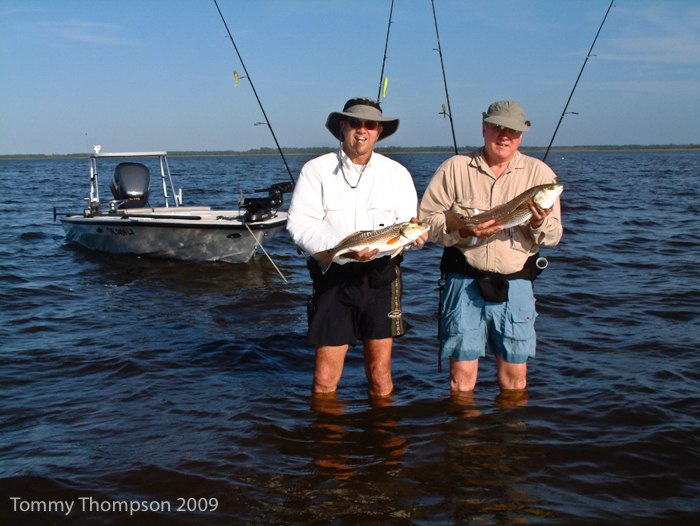 You can have lots of fun fishing on foot, and don’t have to spend a fortune to do it. And the Big Bend offers a fair number of opportunities. Of course, we don’t have those long fishing piers that you’ll find along the more-populated down-south areas of Pinellas County or out west on the Panhandle, but there are some pretty good places to try. I’m going to mention a few, but would also encourage you, my readers, to let me know if you know of others. Not necessarily your super-secret spots, but those you know of—or are willing to share. 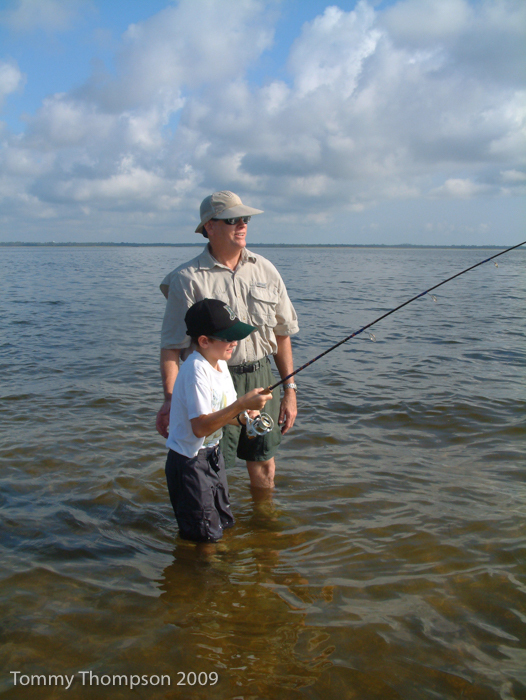 Wading is a good way to teach a kid to fish! Just ask Ted and Teddy Salb! Keaton Beach can be a lonesome place once scallop season is over. The fishing there is great, year-round, as are the facilities. The boat ramp is first-rate and fully operational, despite being beat up by Hurricane Hermine just before Labor Day. And there’s some great wade fishing. In fact, one of the largest trout ever caught here was taken by a young angler wading right off the “beach” at the end of the road. The lure wasn’t fancy (a stick bait) but the trick was that the angler was silent and had the ability to make long casts, two requirements of shoreline fishing. That stretch of shoreline to the north of the public beach has been good to other waders, so give it a try sometime. Just down CR361 (Beach Road) towards Steinhatchee, you’ll see a sign for Hagens Cove. This small county park is a great place to wade. While I prefer to throw D.O.A. shrimp here, it sometimes is necessary to use a lure that’s a bit heavier, like a Paul Brown Devil, especially if I’m casting into a sea breeze. I like to fish the rising tide here and sometimes wade as far out as the imaginary line between Sponge Point and Piney Point, the two landmasses that border the cove. I’ve never really found any real “honey hole” for shoreline fishing in Steinhatchee proper, but if you’ll head to the area near the boat ramp at the end of Sand Ridge Road, you’ll find one. Sand Ridge Road runs from a spot near the intersection of Rocky Creek Road and Rocky Creek Cutoff into the Jena WMA. 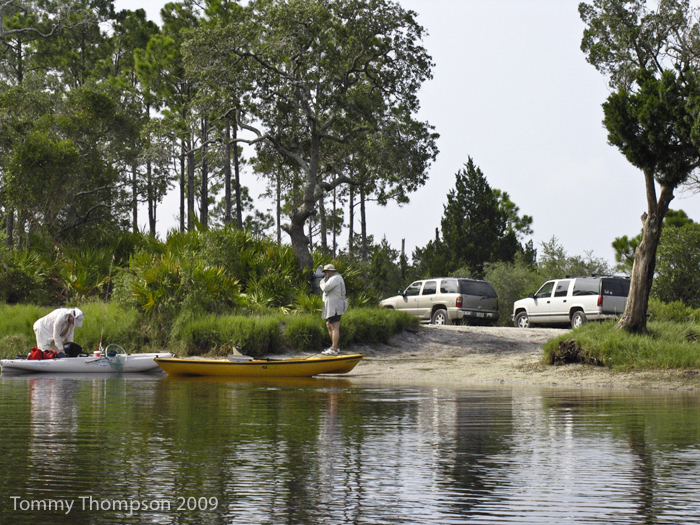 Depending on rain, it’s an easy trip and the ramp at the end of the road allows small boat access to the backwaters of Porpoise Creek. However, if you don’t have a boat, try fishing from the ramp area. A fair number of trout seem to make their way to these waters in the fall. And on the way back, you can stop for a great burger and a cold drink at Casey’s Cove, at the corner of CR358 and Rocky Creek Road. The shoreline near the Sand Ridge boat ramp, south of Steinhatchee, is a good place to wade–and to launch small boats.